It's generally agreed that the most important part of the golf swing takes place in the impact zone, the two inches before impact through the four inches after impact. Now, for the first time ever, PGA Tour professional and CBS broadcaster Bobby Clampett, one of the most recognizable people in contemporary golf, gives amateur golfers the instruction needed to understand the impact zone and hit like the pros. 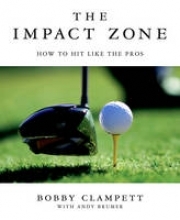 "The Impact Zone" includes not only instruction and drills but also chronicles Bobby's struggles with his own game, a sweet-and-sour, personal lost-and-found golf journey, his emerging insights, the relearning and rebuilding of his swing, and his slow-but-steady discovery of the golf swing's principles. Every golfer can improve his game using the instruction in this book.